In 2018, for a fifth year in a row, Sabine Schwaiger, owner of Adrienne’s Restaurant and Tea Garden, donated a percentage of their Afternoon High Tea sales for February and March toward Heart Health and Cancer Care at Royal Jubilee Hospital through the Victoria Hospitals Foundation. My involvement in fundraising for Victoria Hospitals Foundation is based on my past professional background in working in allopathic and homeopathic pharmacies for many years in the past, where I helped with fundraising and educational events. 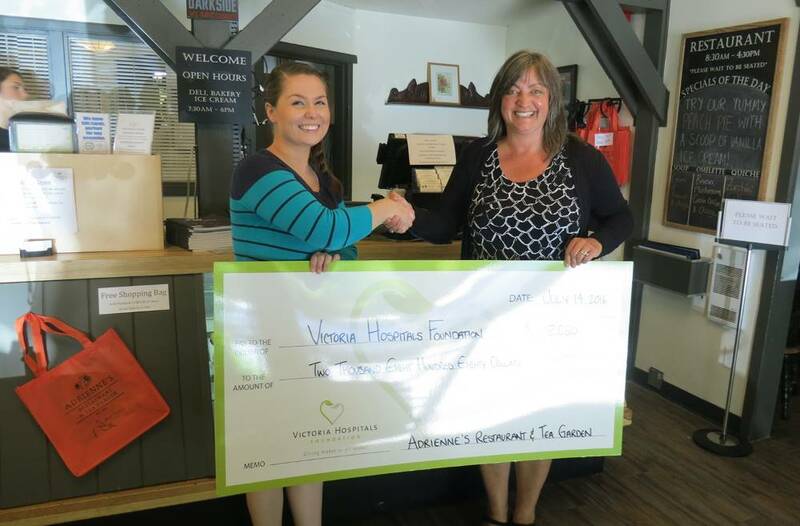 After taking over ownership for Adrienne’s Restaurant & Tea Garden at Mattick’s Farm I wanted to continue to support a variety of community fundraisers and especially the Victoria Hospitals Foundation. I know that everyone at some point in their life will be confronted with a serious health situation in regards to a loved one, family member, friend or neighbour. This is the reason why I decided four years ago to donate every year, in February towards Heart Health and in March towards Cancer Care, a percentage of our Afternoon High tea sales to benefit Royal Jubilee Hospital. In order to support our community, I can only recommend to you all to think about helping others in whatever way you can. I believe that together we can make a difference by donating regularly no matter how much the donation is, to give back to our community. In the case of our donation the funds are used by VHF to buy new equipment which helps with faster diagnosing and treating of patients.